Tax50 Accountant in Wigan serving clients across the UK. Tax50 gives you practical advice on how to manage your affairs in the most efficient manner possible. This advice is tailored to suit your business and lifestyle requirements. Tax50 will help you avoid costly late filing penalties. Not every accountant is the same. Not every accountant will help you in the same way. If you need help with HMRC then look no further. 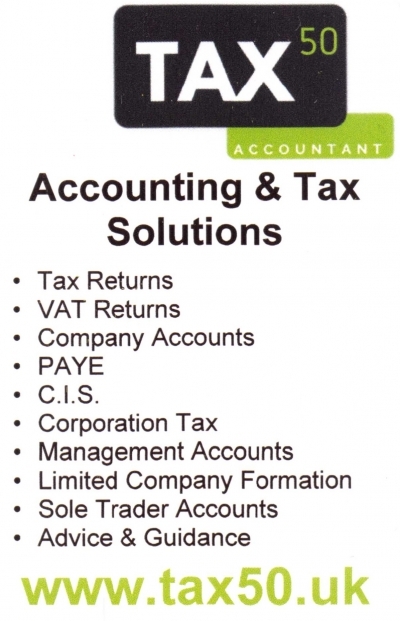 Tax50 will help you with Tax Returns, VAT, Corporation Tax, Bookkeeping Company Accounts, PAYE and C.I.S. Tax50 has the right Accounting Solution for you. Phone Tax50 on: 01942 - 538 239.